Alan Mullery breathes a heavy sigh when asked to recall the infamous moment when he wrote his name in the football history books. It clearly still grates with one of the most cultured midfielders of his generation that he is most commonly remembered as the first man to be sent off while playing for England. "I can never get rid of it," Mullery, who began his career at Fulham, before winning three trophies with Tottenham in the 1960s and 70s, tells BBC Sport. "I played more than 700 games in my career between the age of 15 and 34. People always remember that game - or another one when I scored a volley against Leicester in the cup and it was on Match of the Day every Saturday night for a year. "People just remember those two games, they don't remember the other 698." Mullery's moment of madness occurred in the semi-finals of the 1968 European Championship as Alf Ramsey's world champions took on Yugoslavia in Florence. Incensed by the rough-house tactics of his opponents, and with England trailing 1-0 in the dying stages, Mullery retaliated after a bad tackle and kicked Dobrivoje Trivic where it hurts. "Bobby Moore rolled me a ball to the halfway line and I had my back towards their goal. I knocked it back to him but this fella came in and caught me on the left calf. "Whatever he had on his studs it wasn't very nice and as I looked round the back of my sock it was red, the blood was pouring out and my heart was beating really fast. "In sheer anger I turned round and kicked him in the groin, and down he went like a sack of spuds. "The referee was about three yards away and just told me to get off. Frustration had set in with such little time left, and the referee had not protected any of the English players at all." Moments later, when the final whistle signalled England's exit from the tournament, Mullery headed for the dressing-room fearful of a backlash from his team-mates and manager. "I apologised to the players," he said. "But Alf was very, very good to me. He came in, looked at me with a stern face and said: 'I'm glad somebody retaliated against those b******s.' He was very angry about it. "When I got back, the Football Association fined me £50 and Alf paid the fine, which was absolutely unbelievable. Fifty quid was a lot of money in 1968." England had qualified for the final stages by drawing 1-1 with Scotland in front of 130,000 fans at Hampden Park to top a group of the Home Nations, before defeating Spain home and away in the quarter-finals. 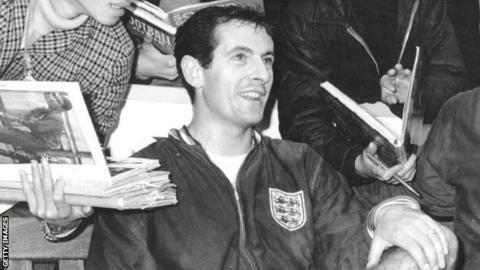 A squad featuring World Cup winners such as Moore, Bobby Charlton, Gordon Banks and Geoff Hurst was expected to do well in Italy but, after losing Hurst and Nobby Stiles to injury in a friendly against West Germany four days earlier, they could not break down a stubborn Yugoslav defence and were knocked out by Dragan Dzajic's athletic finish four minutes from time. The other semi-final between Italy and the Soviet Union is a pub quiz favourite, being the only match in the tournament's history to be decided by the toss of a coin, with the hosts prevailing after the game ended 0-0 after extra-time. The final also ended in a draw, but this time a coin toss was abandoned as a sensible means of bringing a conclusion and a replay was scheduled for two days later. Goals from Luigi Riva and Pietro Anastasi secured what remains Italy's only European Championship success. Meanwhile, England departed with the consolation of third place as Hurst and Charlton scored in a 2-0 victory over the Soviet Union in Rome. Watching from the stands, the suspended Mullery could only stew over the moment that has haunted him ever since. "I felt stupid when it happened but some of the tackles they were putting in were horrendous," says Mullery, who went on to represent England in the 1970 World Cup. "In those days there were no extra cameras in the grounds to pick up off-the ball incidents. "If that game was played now, it would have been abandoned after 20 minutes because they would have had six players on their side and we would have had about nine."